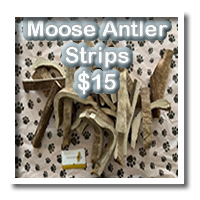 Antler chew toys from Maine Moose Antlers are all natural dog chews that come in a variety of sizes and shapes. 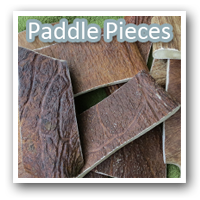 Our hand cut dog chews will provide your pet with hours of entertainment. Our Maine Moose Antler dog chews are for any dog of any shape, breed, or size. We have something for everyone! Ship up to 4 items for only $8.00 Over 4 peices for $14.35!! -	All Maine Moose Antler products are Found and Made in Maine, USA! No animals were harmed in the making of these chews! -	Safe and healthy chewing! 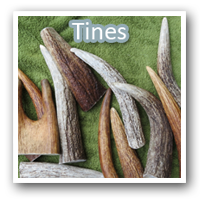 Maine Moose Antlers contain many beneficial nutrients and nothing artificial. will help aide in your dogs tartar control. can be brittle. Your dog's chewing will grind the antler down slowly. -	Maine Moose Antlers Premium Dog Chew Toys are a great alternative to rawhide and other messy, easily destructible, dog treats. 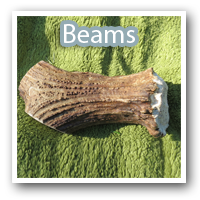 -	Maine Moose Antler Chew toys have virtually no odor or residue to get on your carpet or furniture. chew weight can vary considerably.